Check out the newest resin creation from Random Skull Productions, Casey the Coffin! Debuting on Halloween (naturally! ), Casey the Coffin is an anthropomorphic little coffin with arms and short legs. This original sculpt stands 3” tall, 1.75” wide and comes bagged with a header card. 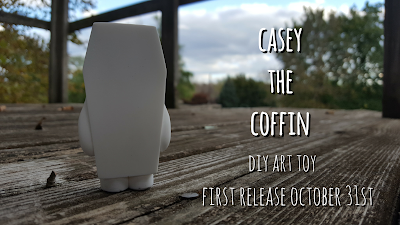 For its first release, Casey the Coffin will be released in an unpainted white Do It Yourself colorway just waiting to be customized! Artists and collectors can purchase this exciting new figure at 3pm EST today, Monday, October 31st, at the Random Skull Productions online store for just $10. Look for lots of new colorways to be released in the future, including some super limited editions that will be packaged in small wood coffins. How rad is that!? !